In a few weeks we’ll gather a team of performers to start creating material for our show Malevolent Creatures. But the process of designing the puppets has already started, beginning with research on British folklore and the selection of a cast of supernatural creatures. We gave descriptions of those creatures to artists from across the US and asked them to create images to inspire our puppet-building. Here is a sneak peek at two of them. Both were created by former students at the Maryland Institute College of Art (MICA). 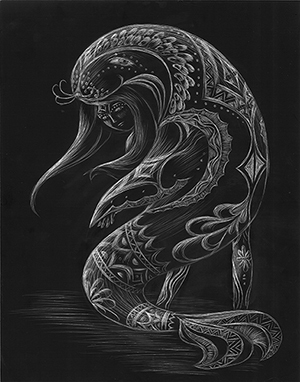 The Selkie (a seal that can transform into a human) was created with scratchboard technique by Jordis Brier, an artist originally from Hamburg, Germany and now living in London. 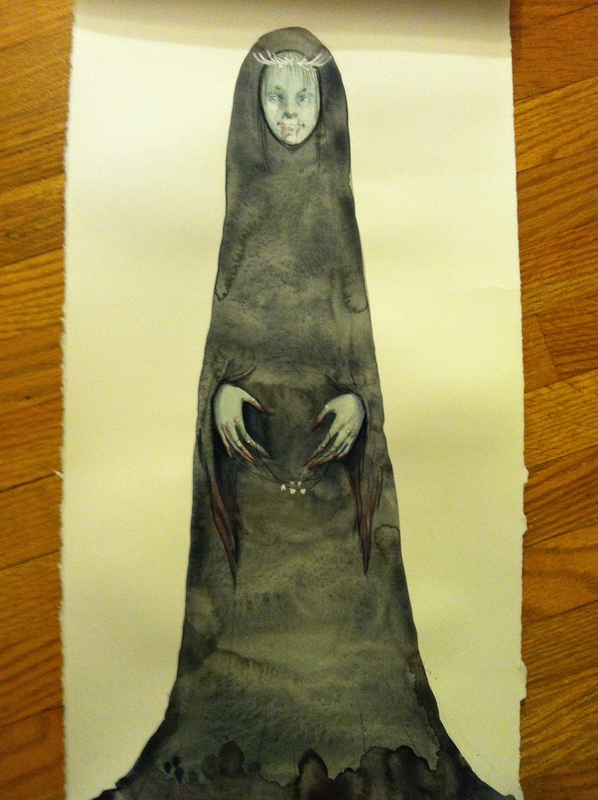 Black Annis, a cannibal witch with connections to nature spirits and goddesses, was created in watercolor by Amelia Gossman, from Maryland. We are incredibly excited to turn these images into puppets and we hope you enjoy this beautiful, imaginative art! This entry was posted in Inspiration, Puppet Building and tagged Amelia Gossman, art, Black Annis, British folklore, inspiration, Jordis Brier, Malevolent Creatures, Maryland Institute College of Art, puppet design, scratchboard, Selkie, watercolor by ccbooks. Bookmark the permalink.